Perfect material for ANIMAL CAGES, RV ROOFS, WATER TANKS, HARD COATING, & MELLOW TEXTURE REQUIRMENTS ! LINE-X XS-430 is a two-component, 100% high performance aromatic polyurea spray elastomer system that is zero VOC (Volatile Organic Compounds) and 100% solids. 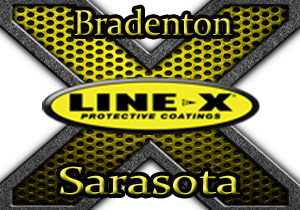 XS-430 offers outstanding performance and superior elastomeric protective coatings for various substrates. XS-430 is designed as a user-friendly product for moisture insensitive applications because of its pure polyurea chemistry, and offers exceptional adhesion properties for properly prepared substrates. The high performance formulation of XS-430 produces an excellent skin formation for chemical resistance and moisture protection. Tear Strength ASTM D624 540 – 585 lbs./in.